The snow came on the heels of near record cold temperatures on Friday. Most of New England received 3-6” of snow Saturday. It was the most significant snow of the season so far in Worcester and Boston. The snow came on the heels of near record cold temperatures on Friday. 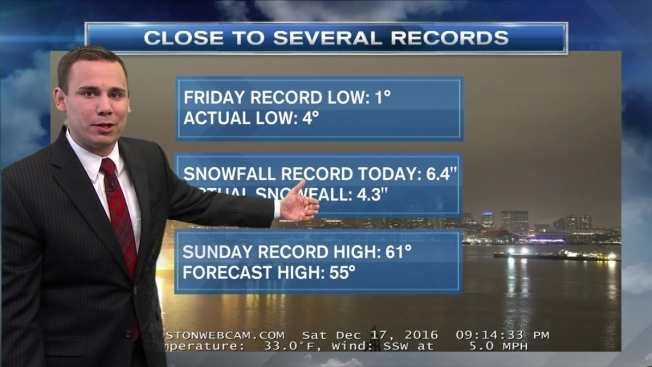 Boston dropped to 4°, which missed the record low temperature by 3°. That 4° low temperature was the lowest recorded December temperature since 1989, and it was the coldest we’ve been since Valentine’s Day! Warm air aloft moved over the cold air at the surface, which helped produce the large batch of snow Saturday morning. As a warm front moves through, the warmth sinks to the ground (sometimes a slow process) – during a cold frontal passage, the warm air is forced out like a snowplow (typically instantly). Temperatures will continue to climb. As of Saturday afternoon, the Cape and Islands already warmed into the 50s; that’s after receiving several inches of snow Saturday morning. Sunday looks to be even warmer. Temperatures will rise into the upper 50s and low 60s in southeastern Massachusetts. We’re forecasting a high of 55° in Boston, but the record for the day isn’t too much higher at 61°. When you do the math, Sunday will FEEL 70° warmer than Friday! Our next round of precipitation will be wet, not white. Most of New England will receive 0.5” to 1” of rain Sunday.